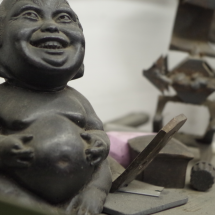 Madacsi Studios is a full service art and design studio specializing in highly crafted ironwork using traditional and non-traditional blacksmithing techniques. 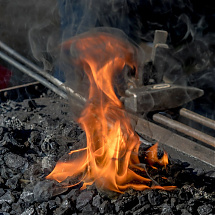 Our mission is to inspire appreciation for the art of traditional American blacksmithing by creating metalwork that distinguishes itself in quality and design. Part of our role as craftspeople is to educate present generations to our trades in order to maintain a perpetual respect and desire for handmade work. It is important to make the distinction between pre-fabricated, mass produced décor and hand-forged, custom designed metalwork to appreciate the integrity of our American-made products and services. 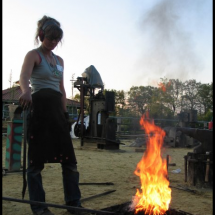 Owner and operator Susan Madacsi, a career artist/blacksmith, founded Madacsi Metalwork, LLC in 1998. Madacsi Studios, LLC was founded in 2014 in Garden City, Idaho and is a part of a rising community of independent artists and fabricators, studios, urban wineries, brewing companies, venues and galleries. In a small community nestled within Boise, the Studios are just a stone's throw from the beautiful Boise River, and only a short drive or bike ride from downtown. Though Garden City is a bit rough around the edges, it offers artists, small businesses and entrepreneurs a chance to work in large spaces, and be a part of a creative community. Madacsi Studios was developed to offer homeowners, business owners, architects, designers, collectors and gallery owners an opportunity to acquire and add heirloom quality pieces with custom design to their collections. The custom studio work is considered an investment to the client; the architectural and ornamental metalworks add value and equity to homes and business. Our work is steeped in American tradition and we relish in the opportunity to share the timeless techniques, to inspire younger generations to maintain perpetual respect and desire for hand crafted and old world arts. 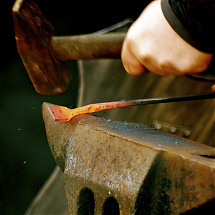 Madacsi works with steel in the traditional forging manor of a blacksmith. When steel is heated to forging temperatures approximately 2200 degrees it can be manipulated in the same ways as clay. She explores and pushes the plasticity of the material in this hot state achieving a variety of layered textures and patterns. Madacsi begins a piece by making a multitude of elements to work with, then intuitively arrange the pieces until she has a composition that she find interesting and captures an element of beauty. 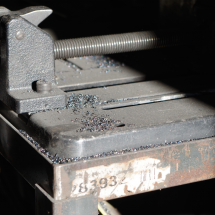 Once a piece carries these aesthetic qualities Susan joins the work together by means of welding and riveting. Finally applying aerosol enamel paint and a variety of techniques to distress the surface. 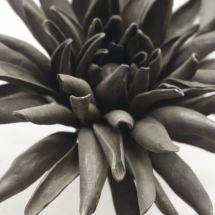 By using pigment she has found that she is able to emphasize the many textures that evolve from forging. The result is an interpretation of a contemporary form that hints towards nature and is an attempt to capture entropy. Although steel is usually first thought of as an industrial material, Madacsi likes to draw attention to our connection with it on a human level, by creating objects that reveal organic forms. Susan's work is the result of her desire to use steel as a substrate for texture, form and as a pallet for exploring color. When creating architectural, sculptural, and special order pieces, Madacsi Studios works closely with the client to design and develop a piece that will be of heirloom caliber. We service private clients who are looking to add value and esthetic to their homes and businesses, and provide them with ideas and examples for their consideration. We work with our clients to create art that integrates with existing or planned architecture and public interaction. These projects present aesthetic and interactive opportunities. Art affects not only a space, but those who live and work in that space as well. 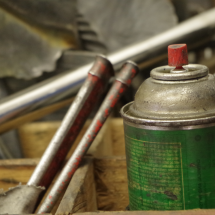 Our clients depend on our experience, as well as our time-honored, well-made, metalwork.